Kim Kardashian's Hollywood may be all the rage for anyone looking for (A-list) virtual escapism but before that, for a young female fanbase there was Purple Moon's Rockett's New School. This "friendship adventure" charmingly embodied the pressure and excitement of getting through obstacles, only this time in junior high and in the game world. Purple Moon, founded by Brenda Laurel, released two CD-ROM games in 1997: Rockett's New School and Secret Paths in the Forest. A purpose behind Purple Moon were to create games geared towards young girls and with the messages of being true to yourself and with others and to stand with conviction when making decisions. Both Rockett's New School and Secret Paths in the Forest were the company's most popular games. In classic CD-ROM fashion, the game took you frame-by-frame during Rockett Movado's first day. 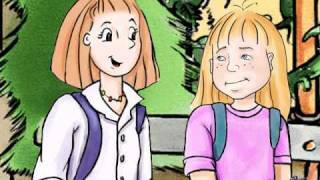 Voiced by Lindsey Andersen in this first installment of the Rockett series, because of her dad's new job, she is now attending the adorably named and suburban Whistling Pines Junior High (remember how Lindsay Lohan's Cady Heron moved from exotic and thrilling Africa to quaint and routine middle America?) Her first friend is the very sweet Jessie who she meets in the courtyard. Think of her as a calmer version of Janice Ian. Immediately, the game's best feature was when it was time for make a crucial decision for Rockett. Her day pauses as you get three options for her to proceed with. The choices usually range from optimistic, doubt, and annoyance. Her inner voices explained what may happen depending on what you pick, and the voice-overs were always true and hilarious to early teen angst. The underlying factor of "Rockett's New School" is the question of whether or not it's better to be true to yourself and stay positive, or to give into the temptation of worry and assimilation. Considering Mean Girls, think of the three-way telephone scene in which Cady feels pressured by her new "friend" Regina George and then in a hasty manner exclaims to her that fellow chum Gretchen Weiners was acting up in school and sharing secrets recently just for the attention. She soon gets acquainted with the who's-who of Pines' social scene. Who could cliques of Unfriendly Black Hotties and Sexually Active Band Geeks in Mean Girls? The social scene of WP of course included the friendly and frat boy jocks, the artsy cabal (the CSGs), and the chosen, or self-appointed, it girls which at Pines were nicknamed the Ones. The Ones were the Plastics of Whistling Pines. Whitney was Lacey Chabert's Gretchen Weiners, and Nicole was definitely Regina George played by Rachel McAdams. There's also their friend Stephanie, but she doesn't appear as dim as say, Amanda Seyfriend's Karen Smith. There were lots of characters at Whistling Pines Jr. High. Poor Mavis (in the right hand corner, red bubble) was basically the weird chick from Mean Girls that adored Regina George, aka, "When Regina wore army pants and flip-flops, I wore army pants and flip-flops". Then there's Rockett's purple backpack! Stuffed with her art supplies and red composition notebook, this fun feature of the game included the usage of her beloved camera (because she's an aspiring photographer). During the game, whenever, as her guide, you feel something is memorable, you would take the cursor and click on the camera and hear a "flash!" sound zing-by! The game would also sometimes make suggestions for you, especially when something exciting was happening or a new character would appear. How about those times when Cady in Mean Girls ate lunch in the girl's bathroom stall? 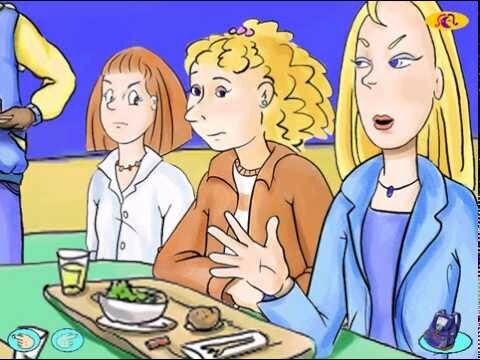 Some of the funnest scenes took place in the cafeteria (which was also some of Mean Girls' most memorable) and Rockett, through her various decisions, gets a firsthand lesson in how nerve-racking, or exhilarating, it can be to go with the flow. Here's an extra clip for fun containing a few of the characters. During breaks on the game, you could also peek inside lockers and read journals. Despite the many social circles, a lot of the characters were more or less alike in just wanting to be accepted for who they were while still finding their way. Purple Moon allowed its gamers to check out personal belongings and even listen to messages on what were most likely based on beepers. This was definitely a much nicer version of getting into another's thought can the Burn Book. (This video is 35 minutes long. You don't have to watch the whole thing but you'll get the idea in minutes). Like how Cady connected with Tina Fey's character, the math teacher, Ms. Norbury; Mr. Rarebit takes a liking to Rockett's talent for art. The creators gave Mr. Rarebit a defective arm that bends slightly inward, making it at first awkward for Rockett to get used to, but he's also the resident hottie of the Pines' teacher's lounge. the now defunct a company and brand Purple Moon took complete advantage of the then still burgeoning world wide web following the release of their games in 1997. 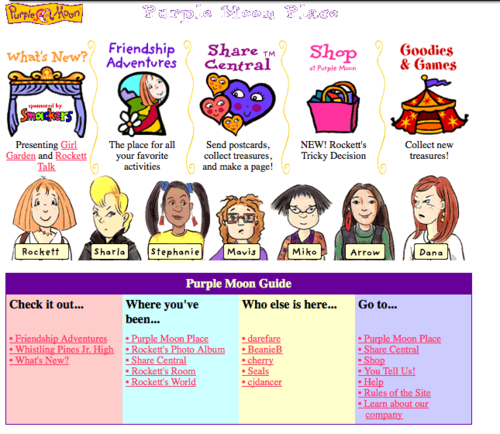 With the tag line of "Meet Me at Purple Moon", they had developed more of an insider look at Whistling Pines Jr. High and its students with a full website of more interactive activities, an online school newspaper and personal pages of the characters for fans of to read up on (especially considering most of the personalities were not always what they seemed). ...but the goal were a little different. Mean Girls was meant to expose just how injurious it was for girls to constantly feel the need to bring each other down, while games like Rockett's New School playfully challenged the act of thinking on your feet. The oscillation between thinking fast and thoroughly planning your next step can be tough and Purple Moon showed you can were capable of bouncing back no matter what!